For our Sunday June 21 Summer Solstice meeting, we will have a very special guest, Taansen Fairmont Sumeru. Taansen will be coming from the Seattle area to share with us several topics – – a summary of his forthcoming book “Cosmic Renaissance – Enlightenment in the Arts”, a time travel experience he had in Switzerland in 1976 in which he stepped into the completed Golden Age in California AFTER The Event, and tools to live RIGHT NOW free from two of the main wheels of the old dark cabal’s enslavement mechanisms — debts and taxes. Taansen is a meditation teacher, celestial musician, heavenly artist, and writer on Vedic Science, higher states of consciousness, and the Dawn of the Age of Enlightenment. He is among millions worldwide who are consciously aware of having incarnated at this time to help bring Heaven on Earth and the Golden Age. What Cobra calls The Event, Taansen foresaw in 1976, looking back from some point in the near future — perhaps sometime between 2015 and 2020 . . . after The Event had already happened. The entire Earth had become a Paradise, a Utopia, and it had all started with a single Moment when the Cosmic Consciousness had flashed “in the twinkling of an eye” within all living beings . . . all humans and even the animals. From that point onward, Taansen saw that outer change came extremely rapidly. He saw this looking back from a point in the future that is now not far off. He saw that the Phase Transition had been much smoother than most people expected, because it is definitely for sure — that from all outer appearances, mankind still has a long way to go in a very short time . . .
Taansen was educated at Maharishi International University in America and at Maharishi European Research University in Switzerland, where he received the title “Governor of the Age of Enlightenment” in 1977 at age 22. Then he continued his studies through hundreds of other seminars, courses, institutes, Enlightened Masters, and the most important of all, inner exploration and self-study. He became a Sannyasin with Osho in 1985, and has been associated with Her Holiness Sri Mata Amritanandamayi, Sri Sri Ravi Shankar, Sri Satya Sai Baba, Sri Karunamayi, Saint Germain, Oneness University, and other Masters and schools. He is a former keynote speaker at numerous international investment conferences worldwide, on ocean cruises and at many exotic tax haven resorts around the Pacific Rim and the Caribbean, on the topic of his highly acclaimed 1997 book “Sovereignty Consciousness“. Taansen is presently working on a forthcoming book called “Cosmic Renaissance — Enlightenment in the Arts”, and foresees creating an Enlightenment Channel for television. Thus part of his talk will be about the dawning transformation in television, music, movies, and the entire entertainment media, caused by the rapidly rising world consciousness and the exponentially increasing rise of Cosmic Consciousness in the population worldwide. Likewise, to be free of taxes, he has been helping people everywhere move their business, personal, commercial, and investment affairs into the exact right kind of pure common law sovereign irrevocable trust – the kind that not only is tax exempt, but also that has no filing requirements. It is the best written version of this type of trust, for many reasons. Be prepared for the global currency reset. Taansen’s “House of Freedom Common Law Trust” makes foreign currency exchanges 100% exempt from capital gains taxes, and has no filing requirements. He said he looks forward to meeting our group and answering any questions you may have. 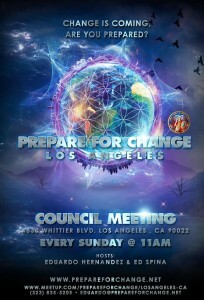 We invite you to join our ‘Prepare For Change weekly Council meeting’ this coming Sunday June 21st. starting 11 am at 4530 Whittier Blvd. Los Angeles California 90022… It is always free! Your Hosts: Eduardo Hernandez and Ed Spina. If you have Facebook please add me as one of your friends and also please click and ‘LIKE’ our ‘Prepare For change Los Angeles’ alternative news page. Kids and Pets are always welcome !